The first book devoted to the epidemiology or epizootiology of insect pathogens. Covers all aspects of the subject, including general principles, concepts and definitions, strategies and methods for research, modeling, factors that influence epizootics, area-wide patterns of disease, all the groups of disease, and practical aspects, such as enhancing disease in pest species, controlling it in beneficial insects or in insect rearing. 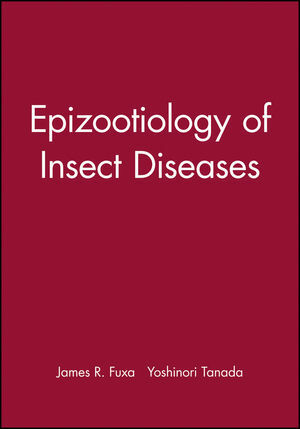 Provides material not readily found elsewhere, such as modeling entomopathogen epizootics, general reviews of the epizootiology of various pathogen groups, consideration of microbial control from an epizootiological point of view, and a general review of epizootiology in prevention of insect disease. Offers the most comprehensive bibliography of this subject anywhere. Well illustrated. James R Fuxa studies Epizootology, Microbial Ecology, and Environmental Risk Assesment. Epidemiological Concepts Applied to Insect Epizootiology (J. Fuxaand Y. Tanada). The Host Population (H. Watanabe). The Pathogen Population (Y. Tanada and J. Fuxa). Patterns over Place and Time (J. Weiser). Viral Diseases (H. Evans and P. Entwistle). Diseases Caused by Bacteria and Other Prokaryotes (A. Krieg). Fungal Diseases (R. Carruthers and R. Soper). Diseases Caused by Nematodes (H. Kaya). Applied Epizootiology: Microbial Control of Insects (J.Harper). Epizootiology Prevention of Insect Diseases (T. Hukuhara).